Amélie Restaurants has teamed up with our good friends at the Nethergate Brewery, Long Melford, Suffolk, to offer you our very own exclusive Golden Ale. Light and refreshing, Amélie Golden is brewed using fragrant citrus hops giving a lovely floral aroma with a touch of spice early on and a mellow bitterness at the end. It is available in 500ml bottles allowing you to enjoy more in one go. – a perfect match with your Flammekueche and the most refreshing tipple of the east. The Nethergate Brewery was founded in 1986 by two friends, one of whom is a businessman and the other a microbiologist. They continue to brew high quality, distinctive beers and have won more than 40 significant regional, national and international awards. For more information on their beers click here! 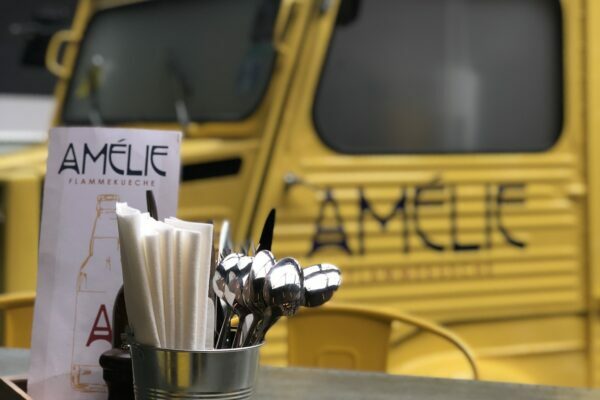 The drinks selection at Amélie Flammekueche has been carefully selected to provide you with a choice of good wine, great lagers and IPAs, soft drinks as well as to give you value for money. Do check out our drinks menu for further information and prices – menu!